Bought a small jasmine tree from the nursery and I don't know whether it is really a jasmine tree. 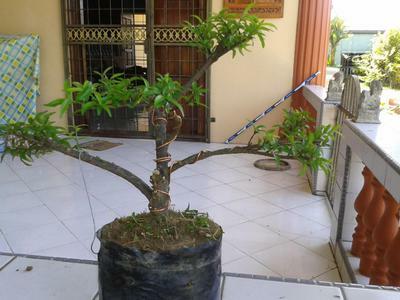 Anyway, since it had small leaves and many branches, I visualized that it might be a good plant to start my bonsai craze after watching all the utubes about bonsai. Brought it home and was so anxious to start pruning, wiring and potting that I forgot to snap a picture of it's original state. Anyway here is the 1st timer's final bonsai...Hope u could give tell what I did wrong and what I have missed. Thank you.